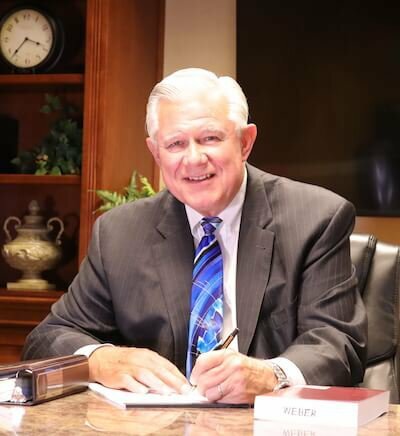 Estate Planning Attorney in Phoenix | Robert J. Weber, P.C. I'm here to guide you past them. Most people reach out to me because of an immediate concern or need. As I tend to that situation, I consider both current and future consequences. No matter the case type, my mission is always to guide people toward clearer, healthier futures — for their sake and the sake of their loved ones. "Life is going to have its twists and turns, but I’m here to offer my experience and professional connections when you need help getting past them." I’ve been practicing law in Arizona for over 45 years now. I’m very familiar with the legal customs, as well as most law firms, in the area. When it comes to helping my clients, I don’t hesitate to pull those resources as needed. From the moment I first meet with you, you won’t be rushed. Rather, you’ll be educated on your options, guided toward solutions, and encouraged to ask questions. After so many decades of experience, I’m going to have suggestions on the best way to proceed with your case. Ultimately, though, it’s your decision that’s important. As I get to know you, I will constantly be brainstorming a strategy to fit your circumstances. When it's time to move your case forward, we’ll look at that plan together. What makes sense for one person may be completely irrelevant to the next. That’s why I build each client’s strategy from the ground up. Over the years, I’ve been a judge, a defender, an estate planner, and more. My unique insights stem from a versatile background in law. Whether you’re exploring options for the future, struggling with a probate matter, or combatting a criminal charge, I’m on your side. The whole experience was very professional and we couldn’t be more pleased. What really set Mr. Weber apart for us though was his thoroughness and attention to detail. My wife and I were looking to update of will since we had recently moved to AZ. Attorney Weber was recommended to us and we decided to contact him. We are so glad we did. We were very pleased with the way our estate planning was handled, thought his price was fair and would recommend him to our friends. And I will go that extra mile — literally. If you can't come to my office, I will come to you. My practice is diverse and, as a result, so is my clientele. Some of the people I work with reside in senior care facilities while others live at home. As for my criminal defense clients, they sometimes need help all the way from the county jail. For various reasons regarding health and legal standing, many of my clients are unable to come into the office — but that’s okay. I’m no stranger to travel. In fact, I’m quite accustomed to meeting with people in assisted living centers, hospitals, at home, and in jail. When a client needs a consultation, I’m always willing to meet with them. Of course, “going the extra mile” isn’t just a literal phrase, and I like to think that my service goes above and beyond in more ways than one. Aside from traveling to meet with clients, I strive to exceed their expectations at every turn. For instance, I personally meet with each client for our initial consultation and dedicate as much time as needed to ensure all their questions are answered before we proceed. I also strive to help a wider range of people by extending my service well past the city limits of Chandler, where my office is located. In fact, my services encompass Mesa, Gilbert, Tempe, the entire East Valley, Pinal County, and the greater Phoenix area. I take these extra steps in my practice not because I have to but because I want to. If putting in some additional work means making a difficult time a little easier on my clients, I’m more than willing to put in that work. © 2019 Robert J. Weber, P.C.